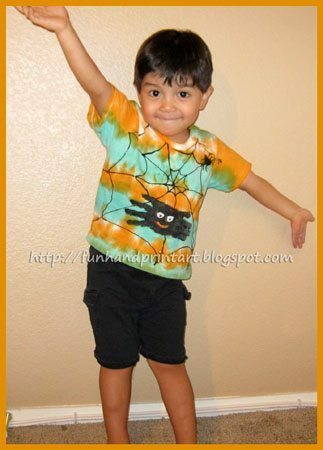 My son had some white t-shirts that had a few stains on them, so I thought it would be fun to make a couple Halloween Shirts with them to try and hide the stains. Originally, I wanted to just make a tie dye shirt in Halloween colors, but for some reason the dye made ugly darker spots in some areas. My solution was to make a Handprint Spider over the area with the most spots. To make the Tie Dye Shirt, fold up the shirt accordion-style. You can do this either side to side or bottom to top. Next, wrap rubberbands in even sections. 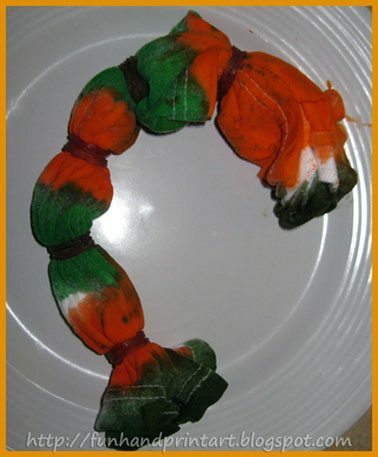 Alternate the orange dye with the green. You want the same color on both sides of the rubberband and a white space in between each color. My white spaces disappeared because I added too much dye. Let it dry overnight and then rinse until the water runs clear. 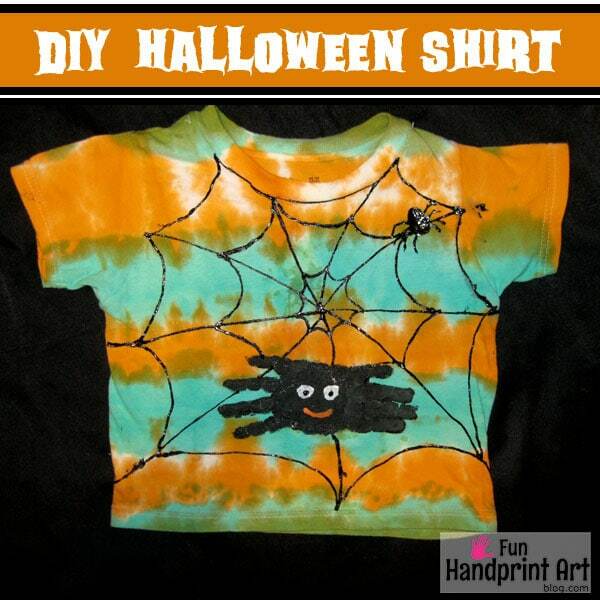 To make the Handprint Spider and Black Web, first place a piece of cardboard (I used a magazine) in between the shirt so the paint doesn’t leak through to the back of the shirt. Paint one hand black (minus the thumb) and press it firmly on to the shirt. Repeat with the other hand and overlap the palm areas when pressing it down. Set it aside to dry. I used black fabric paint with a tip to make the spider’s web, but you could also use a fine paintbrush and acrylic paint. I started by placing a dot where I wanted the center of the web. Then, I painted the lines coming out from the center and finished by adding the u-shaped connector lines. I also added another spider to the web. To finish the handprint spider, I used my son’s thumbs to make eyes and drew on an orange mouth. This is adorable! We did a similar spider a few weeks ago but on a canvas. The shirt came out great! Nice project idea! I make tie dyes Contact and I’ll be glad to get help in any way that I can. Thanks for keeping art and color alive!